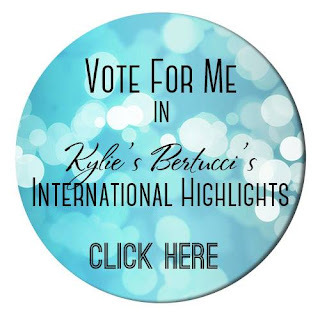 Welcome to another International Highlights hosted by Kylie Bertucci. Kylie invites crafters worldwide to unite in a showcase highlighting a particular theme. This months theme is Life Changing Occasions. I have a niece who is going to experience a life changing experience in December. She will be having twins. We are so very excited. We know she is having one boy but the other little one is being a little shy. So I know with this card I will have one card that will suit when she has her bundles of joy. I absolutely love this stamp set. And I think water colouring it is the natural choice to add the softness you expect with a new born card. To see what I have used to create this card, be sure to check the products list at the end of this post. But first, how about you pop over to the gallery HERE to see what everyone has created. Did you know you can vote on the projects too? I would love for you to vote for me. Voting starts on Thursday 19th October.